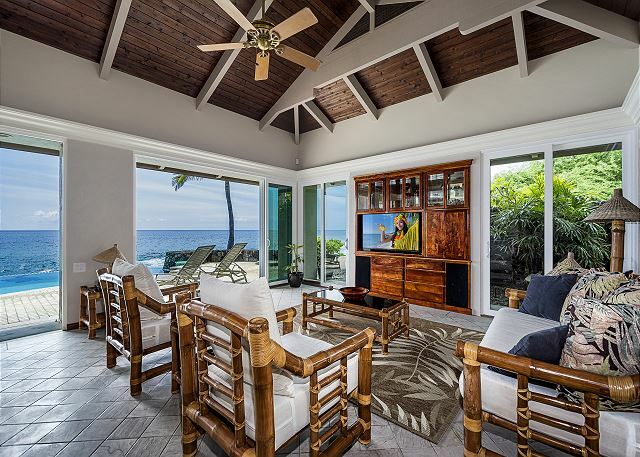 Experience a vacation of a lifetime in this massive oceanfront custom home tucked away in an exclusive and quiet gated community along the Kona coast. 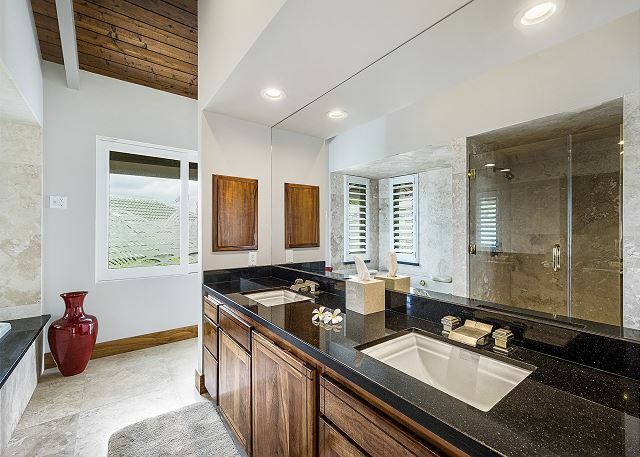 A pond with a waterfall, filled with flowers welcomes you upon entering this beautiful custom open-air designed 3 bedroom, 3.5 bath home. The ocean front master bedroom suite with a king-sized bed has its own private balcony and a comfortable seating area with a flat screen TV. 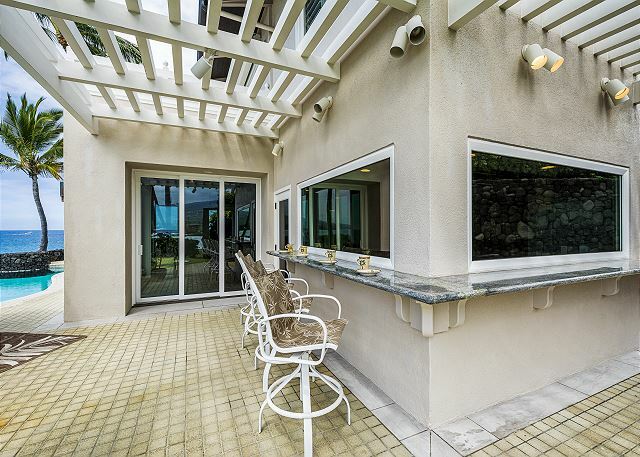 The outside living area provides the ultimate Hawaiian outdoor living experience, with cool tropical breezes coming from the ocean. 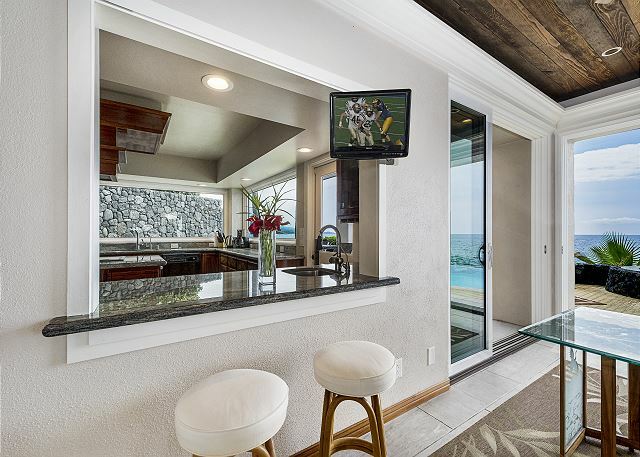 With uninterrupted ocean and sunset views from the living, dining, and kitchen areas, and a fully equipped open-design kitchen this home offers it’s guest ultimate luxury in true Hawaiian style. 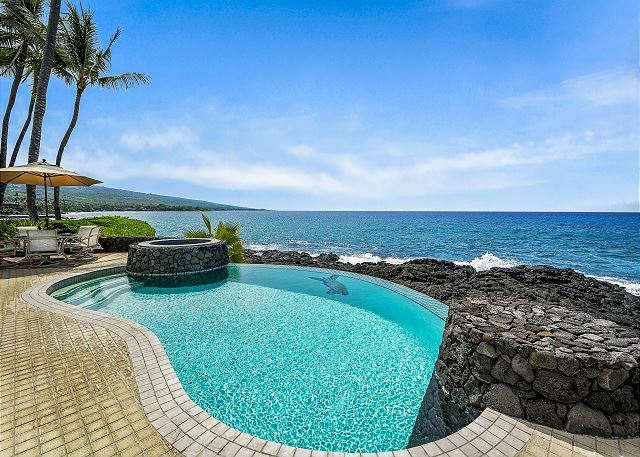 If you are searching for vacation rentals with a private swimming pool, look no further because this is one of the best vacation rentals with a private swimming pool on the Big island. Don’t believe us? Check out the pictures of this home’s private infinity pool and you might change your mind! 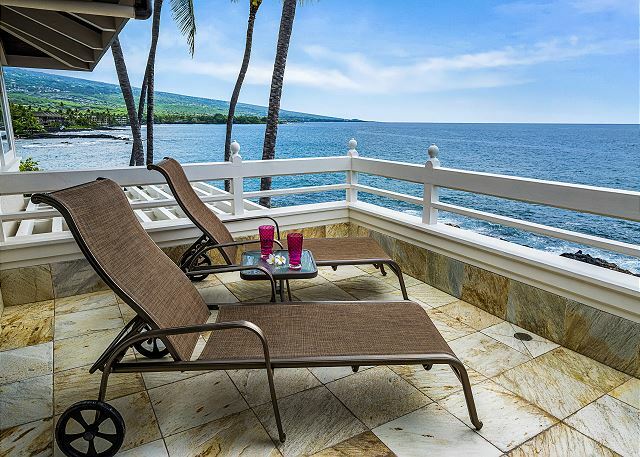 So, whether you are looking to watch dolphins from your private lanai or take a stroll up the coast to experience some of Hawaii’s best scuba diving, our property offers everything you need in a perfect home base to come back to after a day of adventure! 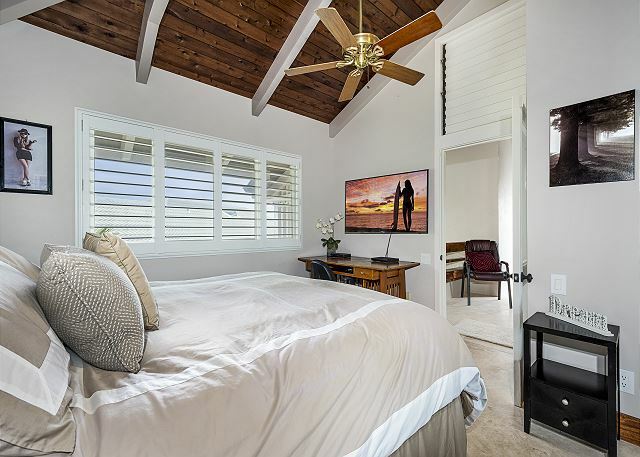 The home is conveniently located 2 miles from downtown Kailua-Kona if you are seeking local markets and historical context, access to shopping, businesses, waterfront restaurants and hotels. Watch the people and the cruise ships come and go from the Kailua Pier. Visit the famous Farmer's Market. Enjoy a shave ice or a cup of Kona coffee, have a light snack or a gourmet meal, buy an inexpensive souvenir or a piece of fine art, book an activity, go for a swim or hang out on the many beautiful beaches. Kahalu’u Beach State Park, famous for its encounters with the graceful green Hawaiian Sea Turtles is located just about 2 miles to the south. Up the coast is a busy marina with Hawaii's best scuba diving, big-game fishing, kayaking, dolphin and whale watching and other ocean activities. 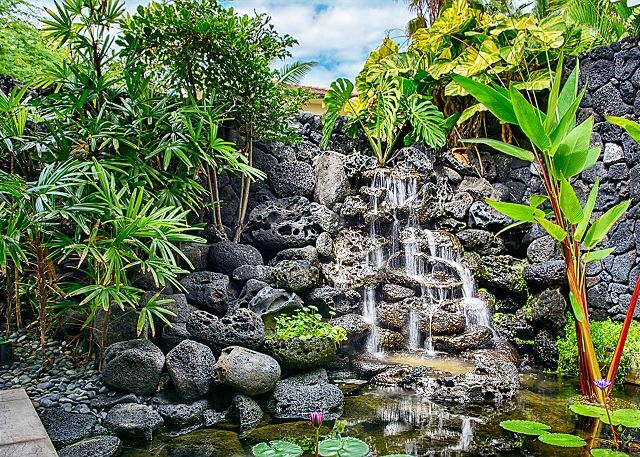 Ali Point is conveniently located, a great home base to explore the many wonders of the Big Island including Volcano National Park, Mauna Kea Observatory, coffee and macadamia nut farms, artist communities, and more! Note! This home is located in a small, upscale, quiet subdivision (strictly enforced noise rules) and might not be suitable for children due to the infinity pool, rock wall as well as the location of the bedrooms. The hot tub at this property is solar heated and is heated when weather is conducive from 9am to 6pm. If the solar panels are not exposes to direct sunlight the hot tub will be the same temperature as the pool. With a secluded master, the house is perfect for 6 guests. Would be nice to have two beds in one of the guest rooms. The house was everything we wanted. We enjoyed a vow renewal ceremony in the yard, and took family photographs right in front of the property. The koi pond was great white noise for the bedrooms. Concierge was great. We had had beautiful flower arrangements delivered that brightened up the place. Massages in the yard are a must. Thank you for your lovely review of Ali'i Point. It joys us to hear the home was everything you wanted. We do hope you can stay with us again with our repeat guest discount. Mahalo nui loa! Nice experience at Alii Point. We stayed for a week and were able to explore the tidal pools in front of the home and watch whales and dolphins from the pool deck. The privacy of the pool area was also really nice. Thank you for posting this review of your experience at Ali'i Point We are happy to hear you had a beautiful stay with an excellent location. Thank you. We sincerely hope you return, and please do contact our attentive property manager for our coveted repeat visitor rates which are the best you can access. Alii Point was a beautiful home in a great location. 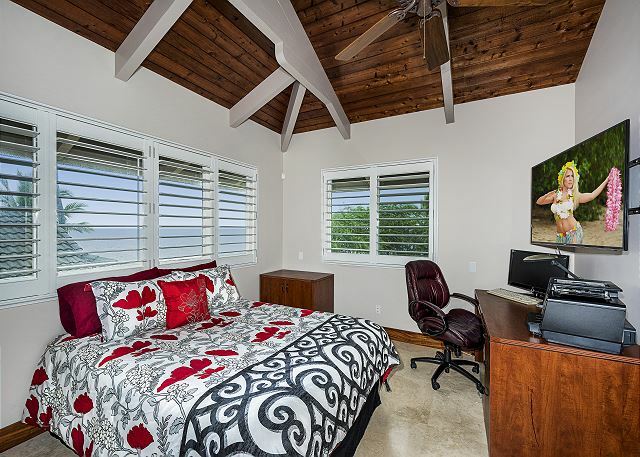 Boundless Hawaii took great care to address any issues and the house was very nicely furnished. We're happy to hear you enjoyed your experience with us! Please feel free to contact Boundless Hawaii for all future Big Island accommodations! Great place with an amazing view! Only disappointment was that the hot tub was cold! Sorry to hear the hot tub didn't get hot for you! We would have gladly had someone address that during your stay had we known. We encourage you to stay at the home again and in exchange we'd be happy to offer you a loyalty discount! 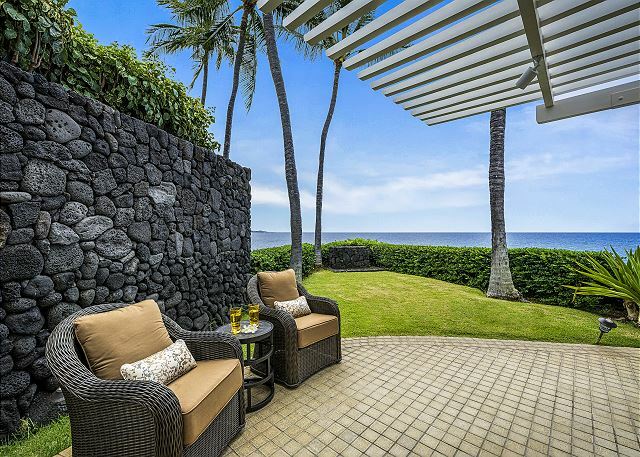 Ali'i Point is a beautiful home right on the ocean with amazing views. We saw sunsets and whales right from our lanai. The home has an open feel with many full-open sliders. It is also well-appointed and has a water-fall pond. 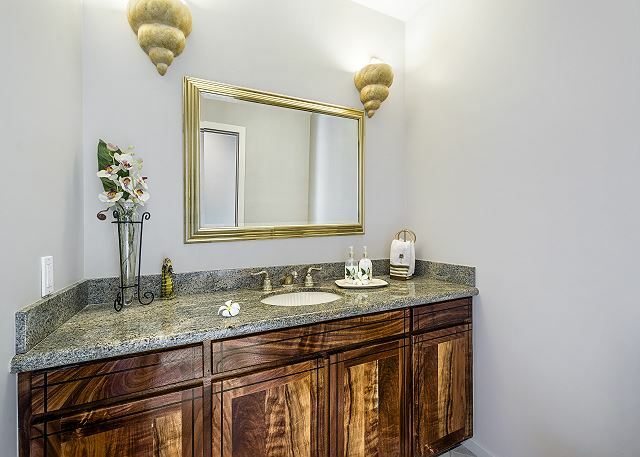 The home is in a great location - easy access to fun spots in town, as well as local beaches. Boundless Hawaii staff were fantastic, ensuring we were prepared before the trip and offering their assistance in any way possible. We definitely intend to return to this home! Thank you for the stellar review! So happy to hear you enjoyed every aspect of the home and felt welcomed by our staff upon arrival! We encourage you to return and take advantage of our returning client discount . Aloha and mahalo for your wonderful review. We would be more than happy to host you at any of the Boundless Hawaii properties for a 10% returning guest discount when booked directly. Thank you for staying at Ali'i Point and we look forward to helping you plan your return visit to Kona.